"I already know what MTY is, just give me a download link". 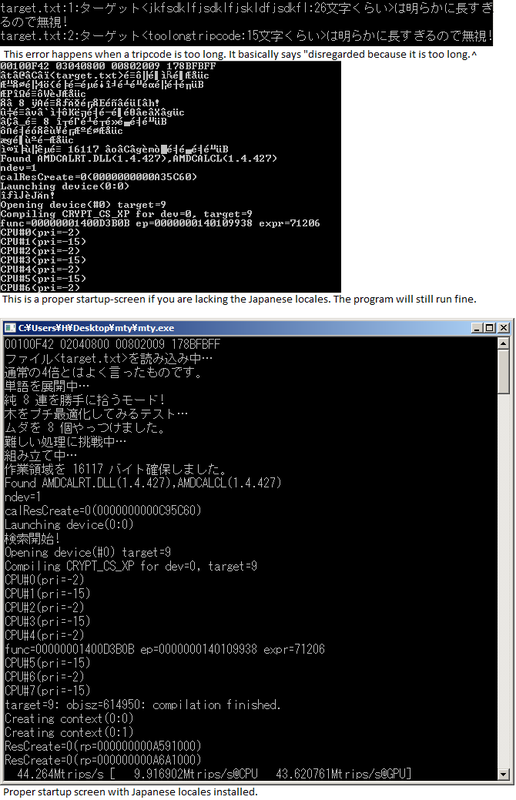 MTY is an advanced work of some Japanese coder, as a project known as "naniya". It uses the GPU as well as CPU to produce tripcodes. The goal is to find unique tripcodes to use on image-boards or similar forums that use tripcodes as a form of identification. MTY is unique. It will use the GPU of any ATi 3xxx+ card. This allows for a lot quicker tripcode finding, vs most programs using CPU alone. Video cards have more "cores" than a CPU does, and hence you can usually get a lot more tripcodes per second in MTY, instead of a CPU-Only program. More examples and information is inside the .zip file. Download it and try it out! Email mtyREMOVETHIS@harry.lu, but ONLY if you have already read the entire README_English.txt!